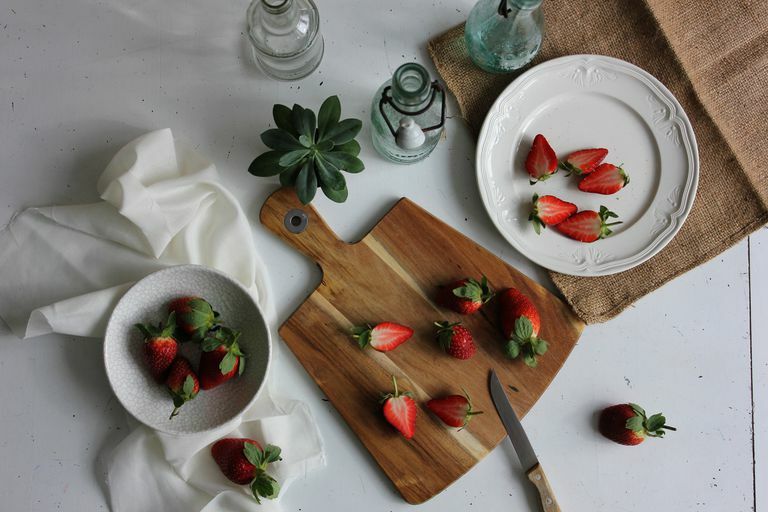 According to Janice Cox, the author of "Natural Beauty at Home," strawberries are a natural source of salicylic acid which is found in most over-the-counter acne medicines. This acid is a gentle exfoliant, ridding the skin of its dead cell build-up and making it the perfect ingredient to use in at-home facial masks. The following strawberry mask recipes work on normal, oily, combination, and acne-prone skin. While strawberries are in season from late spring to early summer, you can buy frozen, organic strawberries and keep them in the freezer so you can make these masks year-round. Let them come to room temperature or close before applying to skin. Note: Salicylic acid can be too drying for dry skin and too harsh for sensitive skin, so if you have these skin types you might want to steer clear of these masks. If you want to brighten your skin tone or heal a pimple problem, this strawberry and yogurt face mask recipe may be a good bet. The yogurt in this mask will soothe irritated skin. Allow the strawberries and yogurt to come to room temperature, then put them in a blender to combine or mash together with a fork (the blender works best). Spread on face and wash off after 10-15 minutes. Cut the tops off the strawberry and place all the ingredients in a blender. Blend for half a minute. Apply all over the face and let it dry for 15 minutes. Rinse off and follow with moisturizer. This strawberry acne mask uses honey, lemon juice, and brown sugar to help tighten acne-prone skin. The salicylic acid naturally found in strawberries is great for skin, as is the beneficial properties of honey and lemon. In addition, brown sugar makes for a wonderful natural exfoliant. Keep this mask in the refrigerator for up to 12 hours. Cooled, the mask will feel even nicer when applied to the skin. De-stem the strawberries and put them into a food processor. Add lemon juice, brown sugar, and honey. Blend in the food processor until a paste is made. If the paste is too watery, add a teaspoon of flour (or more if needed) to thicken. Apply mask to face for 10 minutes and remove with a warm wet washcloth. Aside from their skincare benefits, strawberries are also a natural teeth whitener. Make a paste out of strawberry pulp and baking soda and put it in a tooth tray. You can even use a mouthguard to keep teeth from grinding. Allow the whitening paste to stay on teeth for half an hour. Rinse and repeat once a week.